It is clear that monitoring complex IT environments for risks and threats is key to the execution of successful and productive operations. As years have gone by, IT monitoring tools and technologies have become smarter, more dynamic and better at ensuring that IT environments do what they are supposed to. Yet, existing monitoring methods need to know what to look for. They cannot just deploy at random. As such, the unknowns, the blind spots still remain. 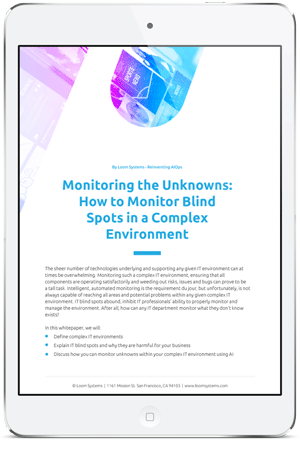 How can you monitor blind spots in a complex IT environment, if you don’t even know they exist? Is it even possible?